Tharuni Conducted one day workshop for the Girls Groups Representatives of 15 villages, at Gangadevi palli of Geesukonda Mandal on 23rd October 2016. The girls are enlightened on Girls Reproductive Rights,Health rights by the founder Member of Tharuni, Dr. Mamatha Raghuveer.She stated about the importance to understand how the human body grows during Adolescence and how they should react with positive thinking , without any apprehensions.During that period what precautions they should take and which types of nutritious food they should eat, was explained with video display, mapping and group discussions among the girls and the Tharuni Resource persons.The girls could identify their problems and learnt how to overcome them.More than 75 girls represented their villages. 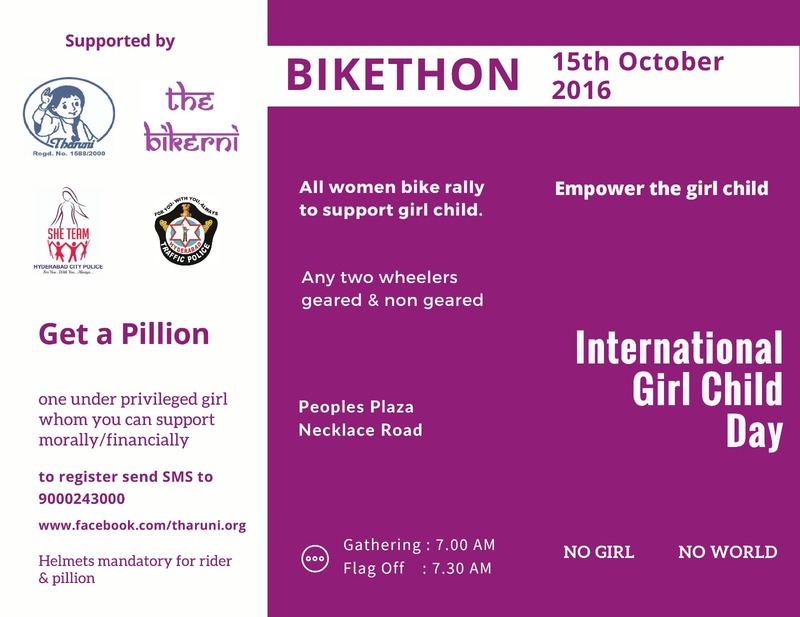 BIKETHON -International Girl Child Day Celebrations -15th October 2016 at Hyderabad-7 A. M.
Tharuni is organising an All Women Bike Rally to support the Girl Child,at People's Plaza, Necklace Road ,near Tankbund, Hyderabad at 7 A.M. on 15th October 2016 as part of International Girl Child Day Celebrations. Any two wheelers, Men and Women who are willing to support Girl children, are requested to attend the celebrations.This event is supported by the She Teams of Hyderabad Police and the Traffic Police,Bikerni-Hyderabad and Hexagon Software Solutions.The Girls from Rainbow Orphan Home and Tharuni Gurukul and Tharuni Warangal are participating in the Event.Many Bikers have already registered their names with their mail IDs. Any person who is willing to participate can register now with a free SMS to No :9000243000. The Rally will be from Necklace road to Sanjivayya Park and return to People's Plaza.A meeting will be held to take a Pledge to support the Girl Child and few Cycles will be distributed to the Girls notified, under the "Cycle to School" Project. All are Cordially invited to support this great cause. Tharuni says, 'No Girl- No World'. 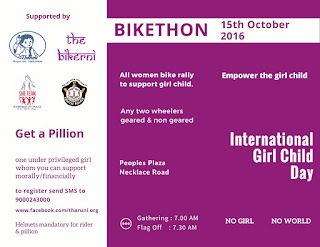 Tags: 4th Bikethon Rally -International Girl Child Day . Tharuni in collaboration with Department of Juvenile Welfare& Correctional Services, conducted One Day Orientation Workshop for Child Welfare Committee Members and J.J.B Members of Telangana Districts and NGO representatives on Child Related Acts, at Hotel Sandhya on 7-10-2016 from 10 A.M to 5 P.M. It was sponsored by Terres Des hommes & HELP under SRHR Project.Mr. David UNICEF Project Officer, WCD, took the first session on the POCSO Act, sexual abuse cases on Children and important sections in the application of the Act and Role of CWC & JJB in implementing it.The second and fourth sessions were taken by Sri Kismat Kumar, Former Director JJB, on the conceptual background of juvenile justice, its evolution, salient features of the Act and its implications while applying it for the protection of the child. The third session was taken by Dr. Mamatha Raghuveer, Founder, Tharuni who presented on the Child Labour Prohibition Act 2016. role of CWC and other practitioners for the safety and protection of the child. The fourth session was again continued by Sri Kismat Kumar on clarifications on other child related acts and procedures to be followed. The interactive sessions between the practitioners and the speakers,, made the workshop lively and interesting. The best interests of the child is the most important concept , while applying these child related enactments, the Speakers observed. 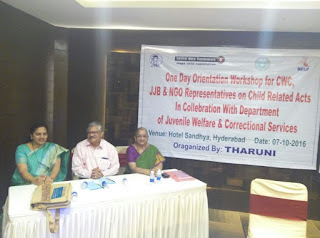 Dr. P. Hemalatha , Director Tharuni presided over the workshop. CWC, JJB Members, Chair persons, NGOs like Mahitha, Divya Disha,MVF and many more Members participated in the workshop. 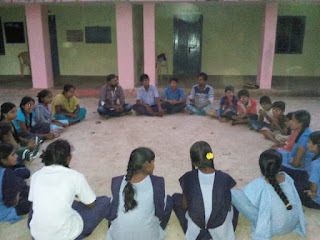 Sathyanarayana Programme Officer and Ravikanth, Programme coordinator of Tharuni Team organised the Workshop.